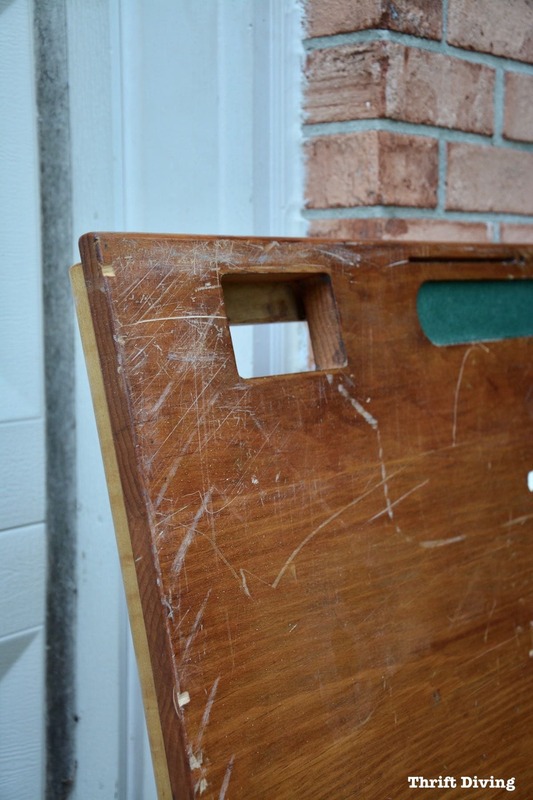 Eat-in Kitchen Table Makeover: Watch This Project in Action! 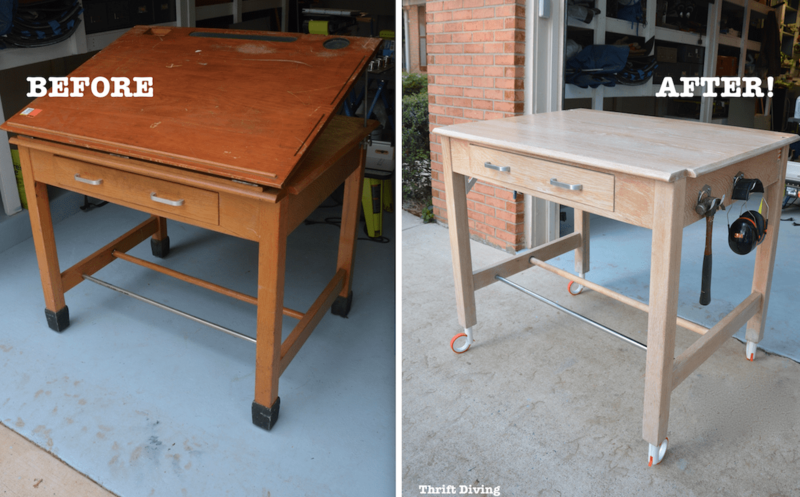 Click below to watch this eat-in kitchen table makeover using an old drafting table! 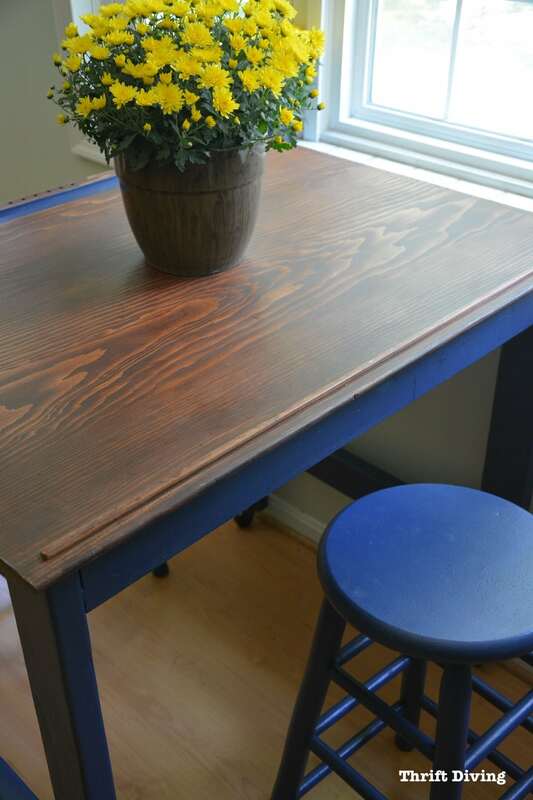 If you’ve been reading this blog for a few months, you’ll know that a few months ago I had turned an old drafting table from the thrift store into a chic, natural wood (solid oak!) workstation for my garage. I added unique caster wheels and fell in love with it! 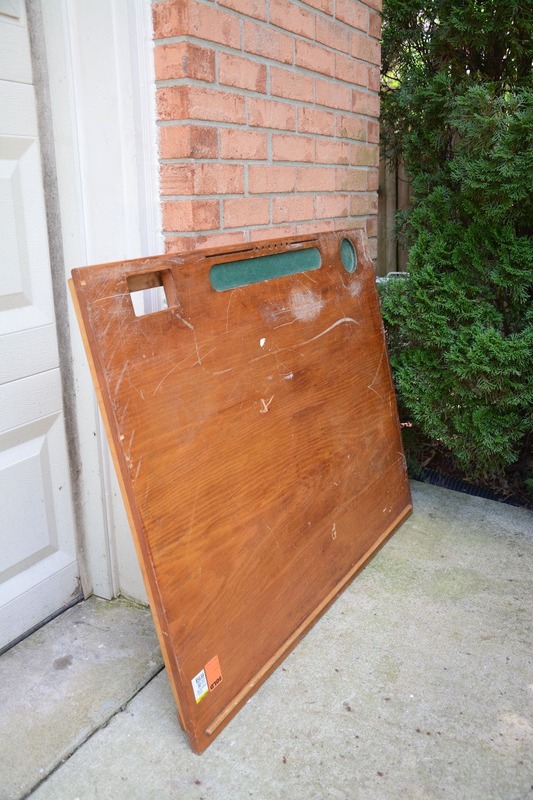 But if you’ll remember, I set aside the drafting table top. Several of you asked if I was going to do something with it. But of course, you guys!! 🙂 The question wasn’t if I was going to do anything with it, but rather, when. This is what it looked like before I started the project. 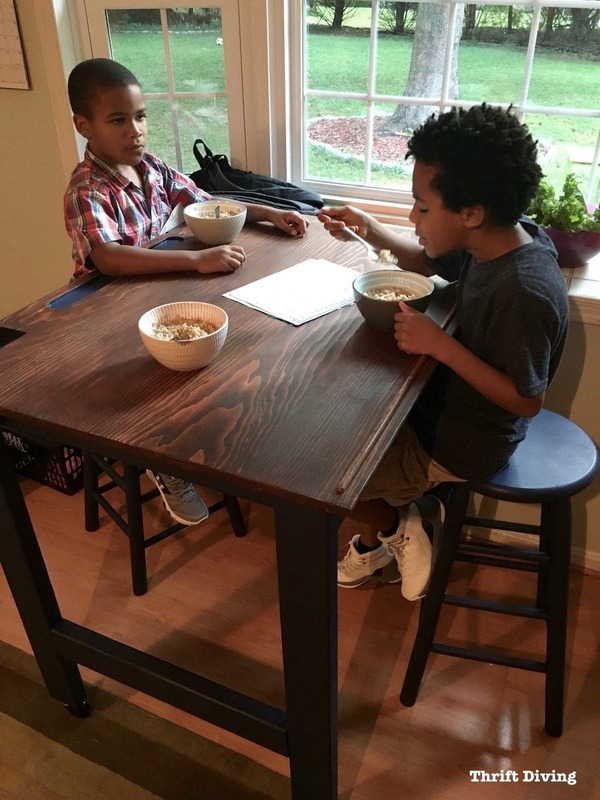 Afterward, it became this super cute functional eat-in kitchen table for the kids to eat and do their homework! Let me start by saying that I’ve fallen in the “I love wood tones” camp now. It doesn’t mean I am throwing away my paint brushes. No, ma’am. 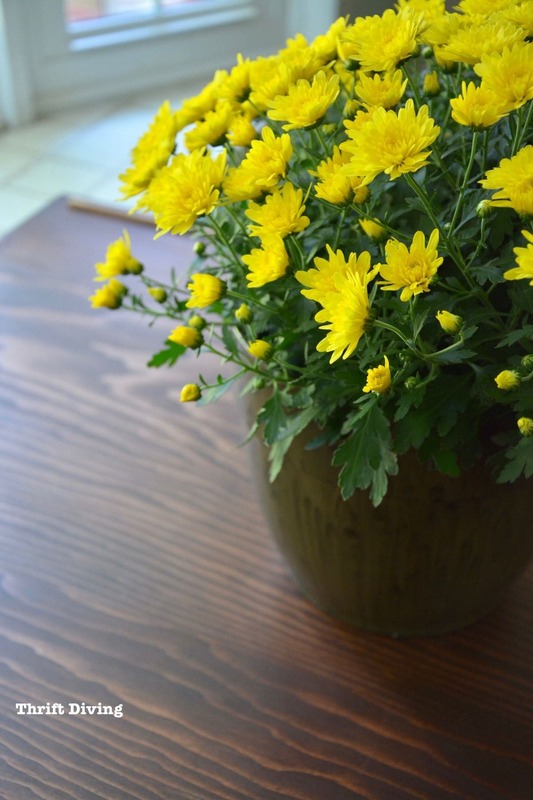 Nope–this table top was real wood (although I have no idea what species). I was going to at least attempt to refinish it back to life. I was going to at least attempt to refinish it back to life. 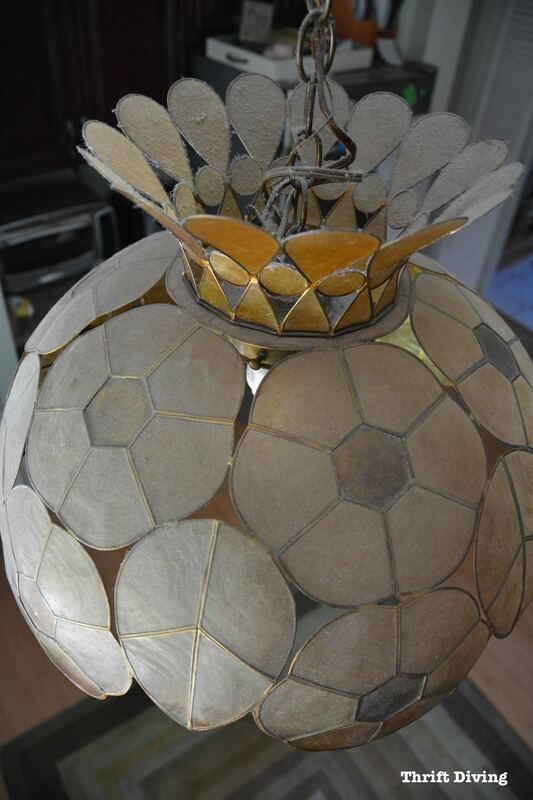 After refinishing the top, I saw what gorgeousness was lying beneath the wear and tear and I knew I had made the right decision to not paint the top! 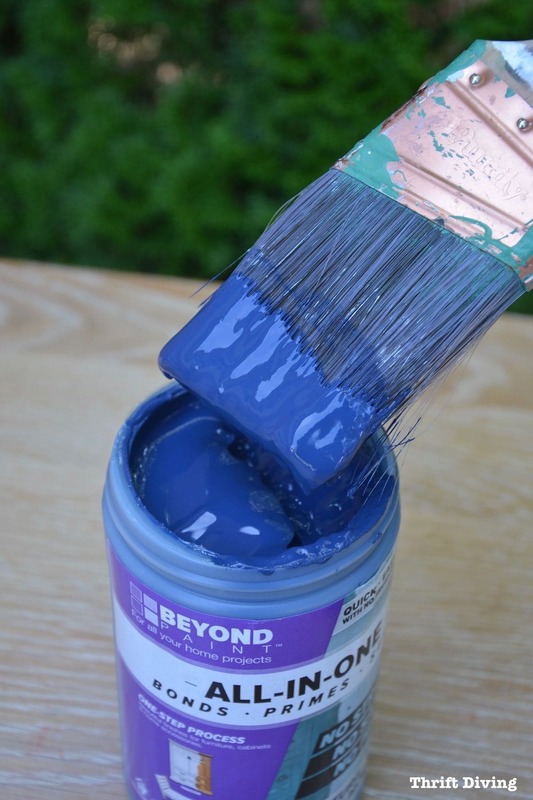 Read next: When Should You NOT Paint Wood Furniture? Now it was time to give them a second lease on life. 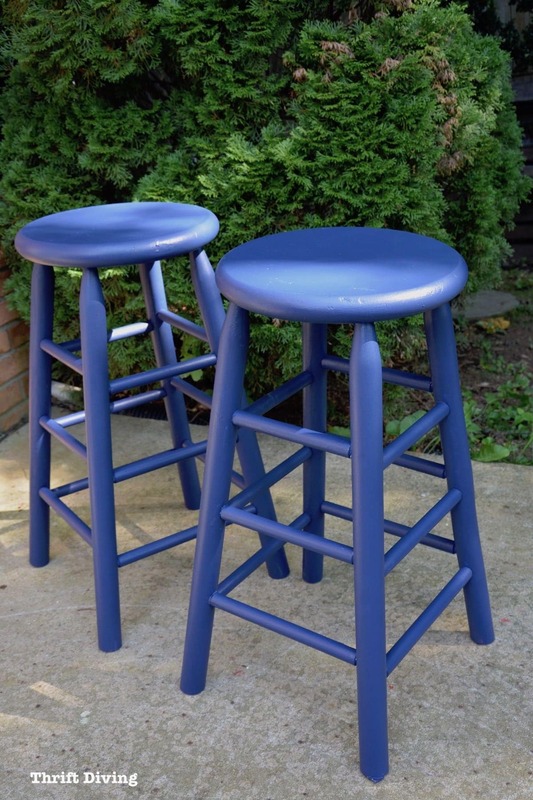 And yes, you can shorten barstools. As you see above, the one on the right is the original height. The bar stool on the left I shortened years ago. 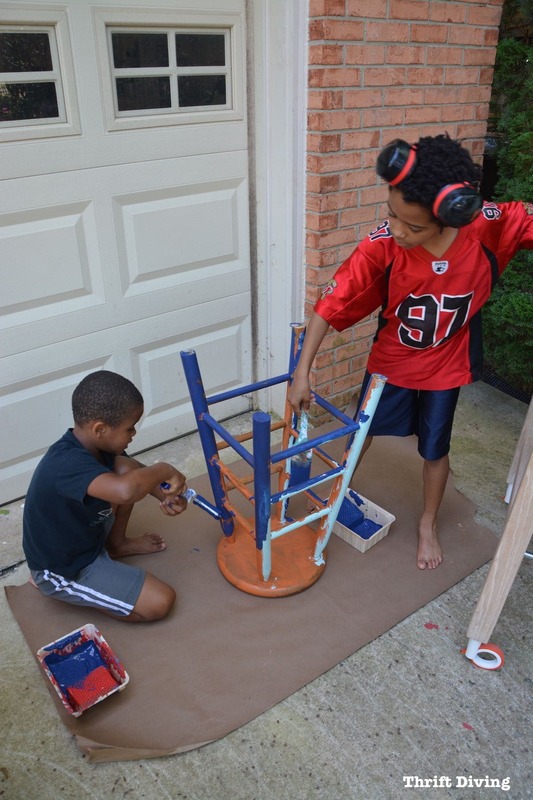 But now, making DIY eat-in kitchen table, I needed both bar stools to be the same height and to fit comfortably under the kitchen table. The fun part is that I got the kids involved! Little Kojo (who just started Kindergarten this week, by the way!!) 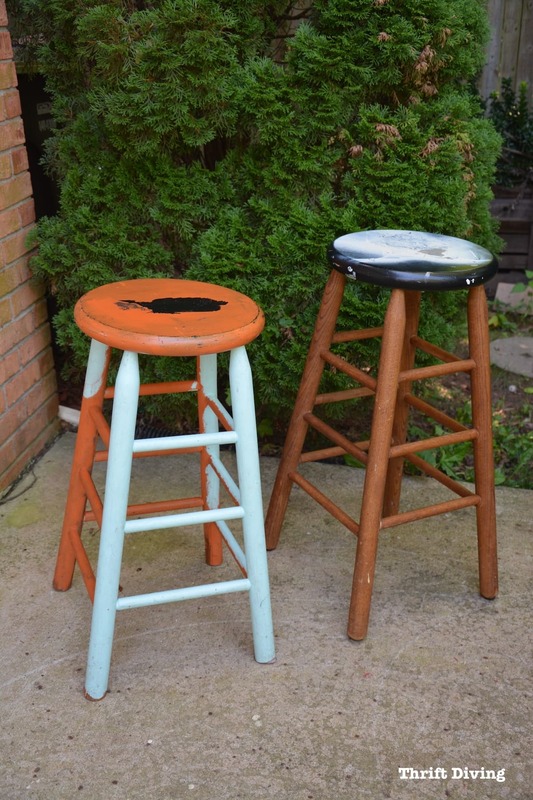 and his brother, Ohene, painted one of the stools and I did the other one. 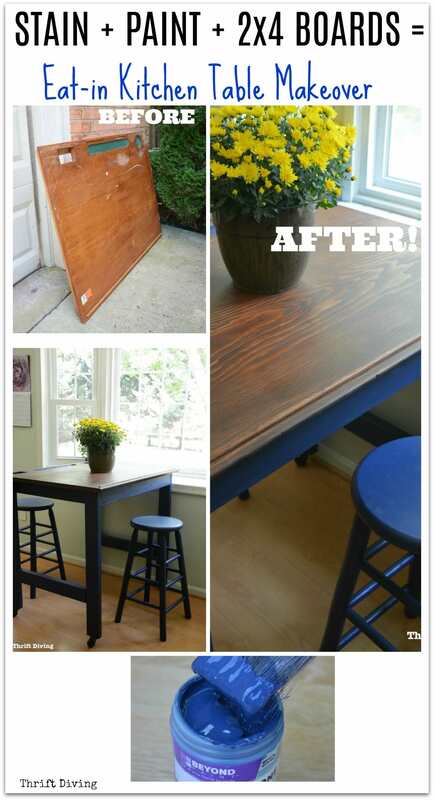 Overall, I was super excited at how the new eat-in kitchen table turned out! The blue is very vibrant outdoors in natural light and I like how it complimented the mahogany stain on the eat in kitchen table top. 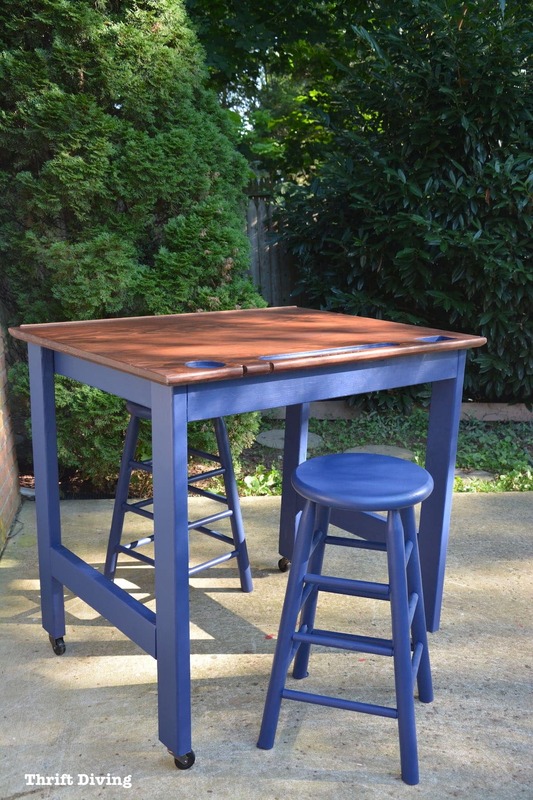 Sometimes I just have to wait for inspiration to strike and after looking at that table top in the garage, I knew the Navy color would make an amazing table base color. Inside, in the dim light of my kitchen (which feels like a dark cave sometimes, LOL), the Navy takes on a deeper color. I Love Having an Eat-In Kitchen Table For the Kids! It’s embarrassing to say but my kids usually eat on the steps, like a pack of puppies at feasting time. They’re too messy to eat in the living room…and who wants to be away from the family in the lonesome dining room?? So the two step-down area of the kitchen that leads into my family room is where I’ve allowed them to eat in an attempt to contain their mess. But they don’t deserve to be sitting there all cramped up, scooping their food off their plates like animals (well-loved animals, of course….). With school starting, I wanted them to have a place to eat breakfast in the morning, a place to do schoolwork when they come home, and a place to sit and have a conversation while hubby or I am cooking. (They look waaaay too serious here, LOL). I like that the eat in kitchen placement is right next to the window. Although I have done some things to the kitchen, it still needs a lot of sprucing up, such as a new pendant lamp, new ceiling lights, updated appliances, and new flooring. But those things will come in time. Next Steps for the Eat-In Kitchen Table! 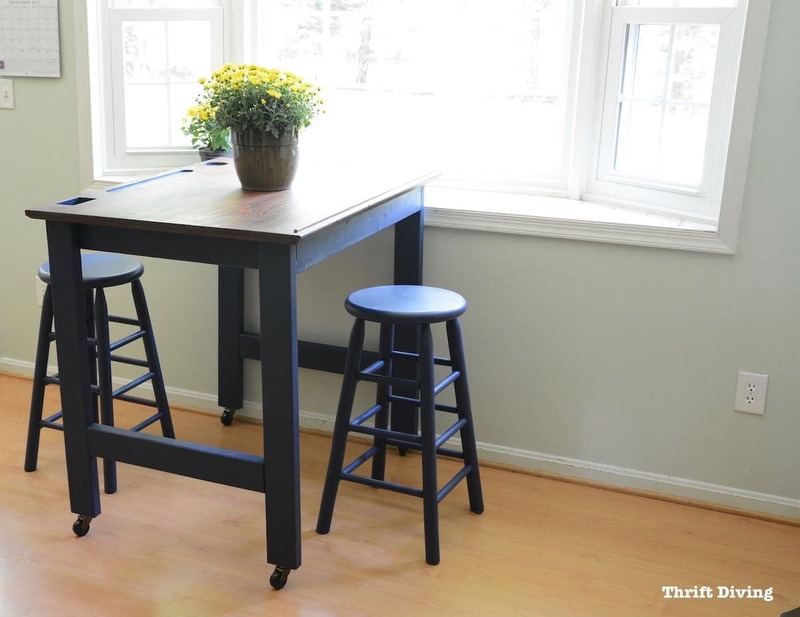 The only thing missing from this eat-in kitchen table (that is bar stool height) is a foot rest. 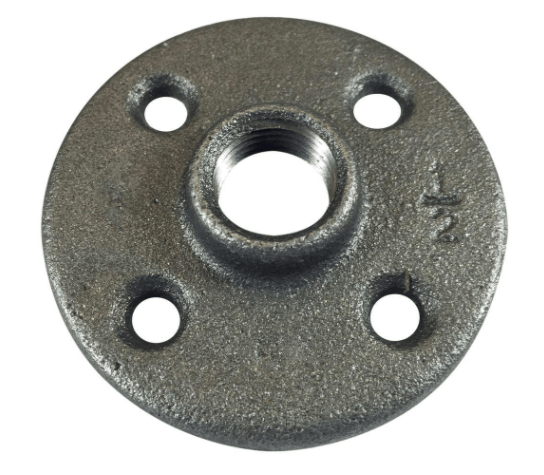 My friend who you’ve known as Thrift Store Pete suggested I add a metal pipe with a metal flange like this one, so that it lends to the industrial look, makes it look cool, and provides a comfy place for people to rest their feet when sitting. But otherwise, I’m considering this eat in kitchen table done! Do you like this project? 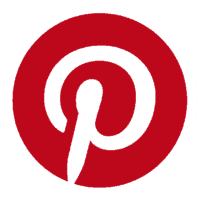 Click HERE to pin it and show it some love! Save this pin for later! 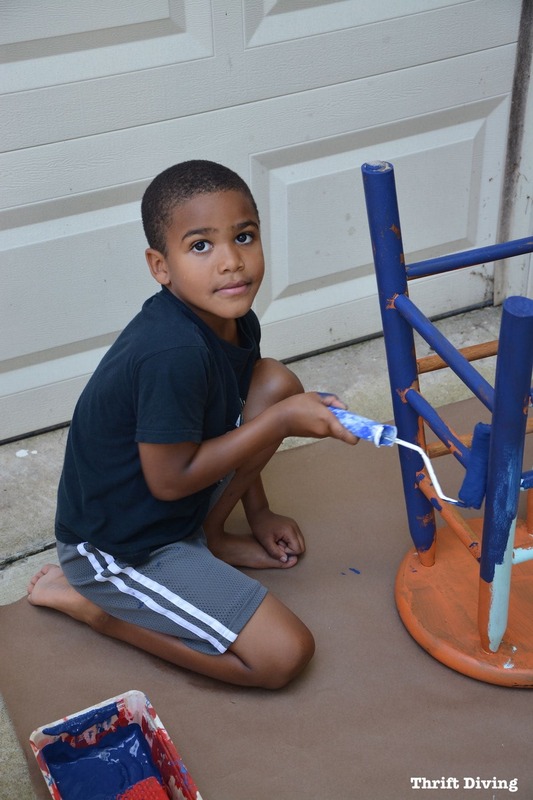 This project was sponsored by Beyond Paint, with whom I love collaborating! I wrote up the full-length tutorial for this project over on their blog, which will be available next week! I’ll be sure to keep you posted when the written tutorial is available so you can pin it for later! 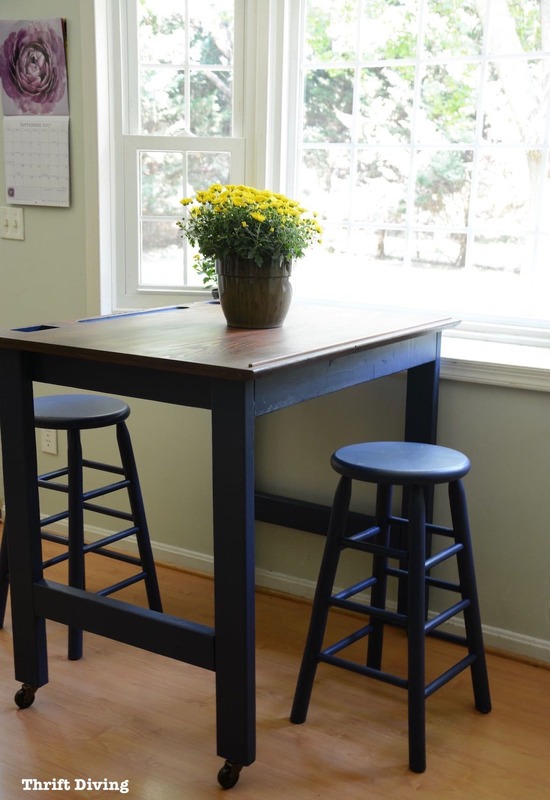 Do you have an eat-in kitchen table in your kitchen? Is your kitchen a place where your family gathers to eat, do homework, and socialize, too? Leave a comment and let’s chat about our eat-in kitchens! You have cute helpers! We love your creativity at Merry Monday! Can’t wait to see what you’re up to next week! Where has the summer gone!! I wish I had the decorating gene. I love how the table being remodeled! I would love to appreciate your ethic works in some ways that I could. They’re just very satisfying! Talking about bringing the table’s color into life. Great work!